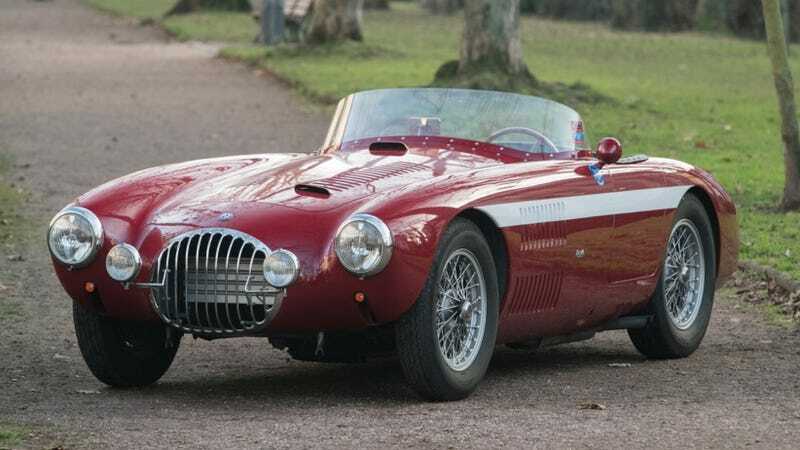 There is beauty to be found in the simplicity of this 1954 OSCA 2000 S. Very little in this car is extraneous, only providing exactly the bare minimum of what a driver might need to get to the end of a motor race. The design, while coated in a liberal sprinkling of bonnet vents, is incredibly simple. Complex shapes are few and far-between in this body-by-Morelli barchetta, and that’s part of what makes it great. OSCA-Officina Specializzate Costruzione Automobili-began as the Fratelli Maserati left their namesake company in 1948. Using a Maserati engine and built by the Maserati brothers, an OSCA is a rarity with excellent collectibility. Only five OSCA 2000 S’ were built, and of those just three were bodied barchetta as this one is. Not only is this car a one-of-three rarity, but it also has motorsport provenance with a 1954 12 Hourse of Messina victory at the hands of Roberto Sgorbati of Brescia. The OSCA was sold off to a new owner in Argentina, who entered it in the 1000 km of Buenos Aires where the engine popped and was withdrawn. From that blown engine, the OSCA was thought lost to time. For 30 years collectors simply assumed the missing OSCA would never be found, but in 1986 it was discovered as a body and chassis but without its original engine. The Maserati Special Six was fitted at that time, and the car was prepared for vintage Mille Miglia events. The car was frame-off restored in 1999 by Quality Cars in Modena, Italy. The body was stripped down to bare metal and some corrosion was repaired at that point. A vintage Maserati specialist assisted with the restoration, redoing the brakes, suspension, steering, electrical harness, and more. The seller claims that the restoration costs exceeded 40,000 euros, and has been faithfully returned to original condition. This is a properly unique vintage race car that many car fanatics have never heard of. If you enjoy driving around in rolling history lessons, and you are okay with answering a hundred inane questions every time you come to a stop, this might be the car you want to bid on. It will be offered on February, 7th during RM Sotheby’s Paris Retromobile sale. For more information and photographs of the car, check out the full auction listing.